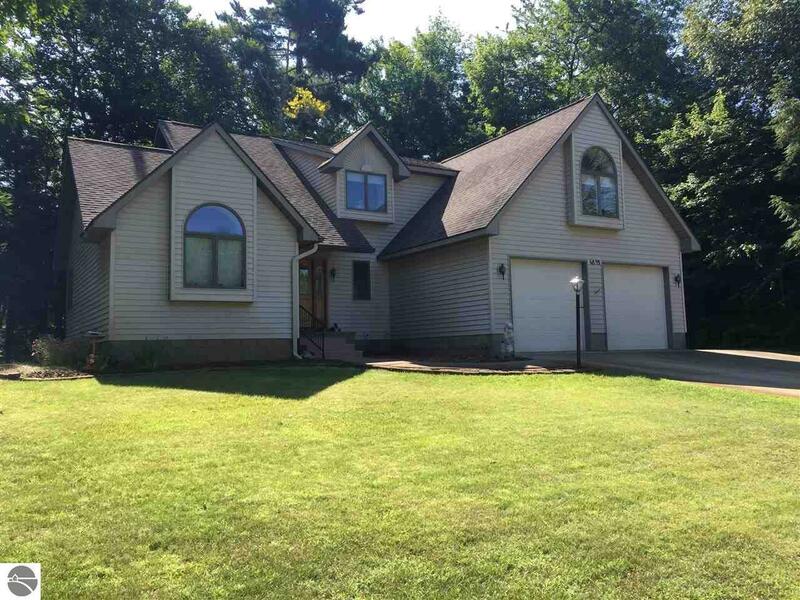 Well constructed 4BR 2.5BA home in Inwood Harbor, north of Elk Rapids. Shared GT Bay frontage and boat launch with picnic area just down the road. Welcome home to the foyer entrance to the grand staircase of this two story home. Oak trim and cabinetry throughout the home. Large kitchen with breakfast bar, cathedral ceilings, hardwood floors in the living room and dining room. Sliders out to the back deck. Main floor master bedroom and bath with soaking jet tub, stand-up shower, and two walk-in closets. Upstairs has an additional three bedrooms, (one is a bonus room over the garage), lots of large walk-in closets, full bath, and a nursery/office. Full basement has a finished family room, storage room, office, and workshop. Mechanical room with access up to the two-car garage. The garage has drywall, cement floors and access to the backyard with a small dog pen and shed. Extra paved parking on the side of the home. Elk Rapids School.